Startups in New Zealand received an unprecedented level of funding last year, with $86 million flowing into early-stage businesses across the country. That’s according to Startup Investment NZ, published by PwC New Zealand, the Angel Association of New Zealand (AANZ) and the New Zealand Venture Investment Fund (NZVIF). “It’s exciting to see such a large number of deals coming through to support early-stage companies. We’re seeing investment levels that are almost three times what we saw just five years ago” said Anand Reddy, Partner at PwC New Zealand. John O’Hara, AANZ Chair, endorsed this sentiment noting that membership of angel networks continues to grow with a new network established in Marlborough last year and a budding network getting started in the Hawkes Bay. Established networks like Ice Angels in Auckland, AngelHQ in Wellington and Enterprise Angels in Tauranga are also experiencing growing memberships. Driving the growth in investment dollars is an increasing number of larger deals in 2017, compared to the year before. 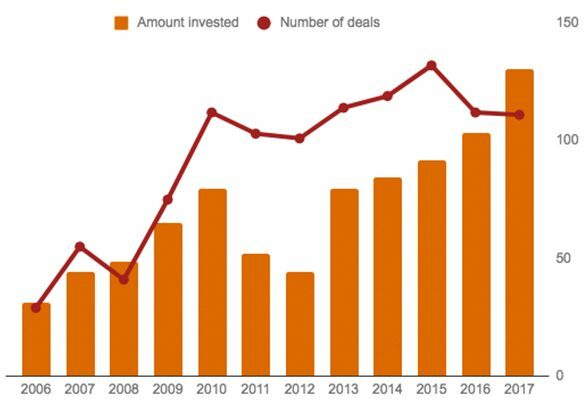 The number of deals in 2017 held steady at 111 – one lower than the 12 months previous – the total amount invested has risen by $18 million, a 26% increase. Offering some insight on the larger number of dollars being invested in a similar number of deals, John O’Hara suggested it reflected a maturing ecosystem. “A number of the ventures angels have backed are now looking for larger capital injections to fuel their growth. With a thin VC industry, it’s not surprising we are seeing larger deal sizes. John also offered a word of caution to investors and founders. “The market’s a little frothy right now. We’re seeing some strong valuations. Entrepreneurs have to be sure they’re not setting the bar too high with their forecast results. If they fail to meet these, it’ll make it make it harder for them to get the next round of funding. Click here to find out more about how the startup sector is evolving, and where it’s heading next. Click here to dive into the data about this asset class. Angel Association New Zealand is the champion for early stage investment. We aim to increase the quantity, quality and success of angel investment in New Zealand and in doing so create a greater pool of capital for innovative startup companies.